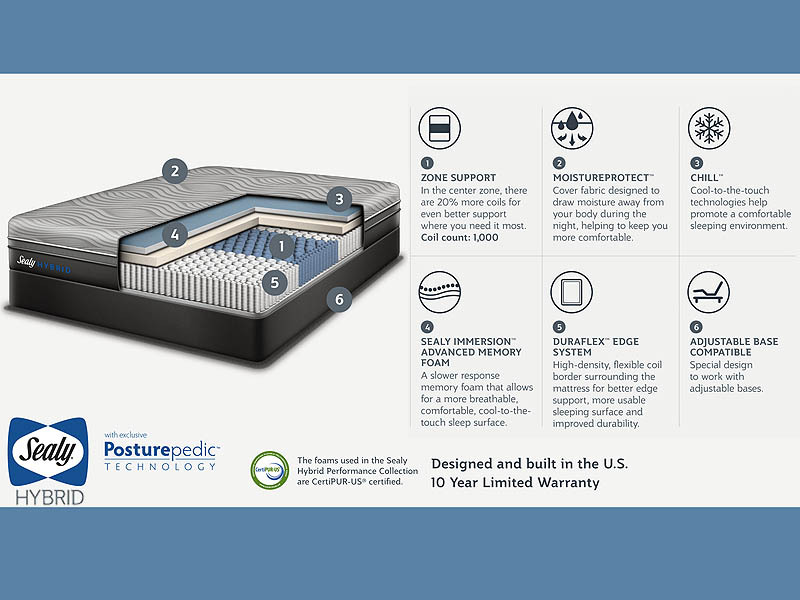 Featuring exclusive Posturepedic Technology and introducing Sealy’s New Immersion Advanced Memory Foam, The Kelbure II Hybrid mattress offers enhanced pressure relief combined with reinforced support where you need it most. Zone Support – In the center zone there are 20% more coils for even better support where you need it most. Coil count: 1000! MoistureProtect – Cover fabric designed to draw moisture away from your body during the night helping keep you more comfortable. 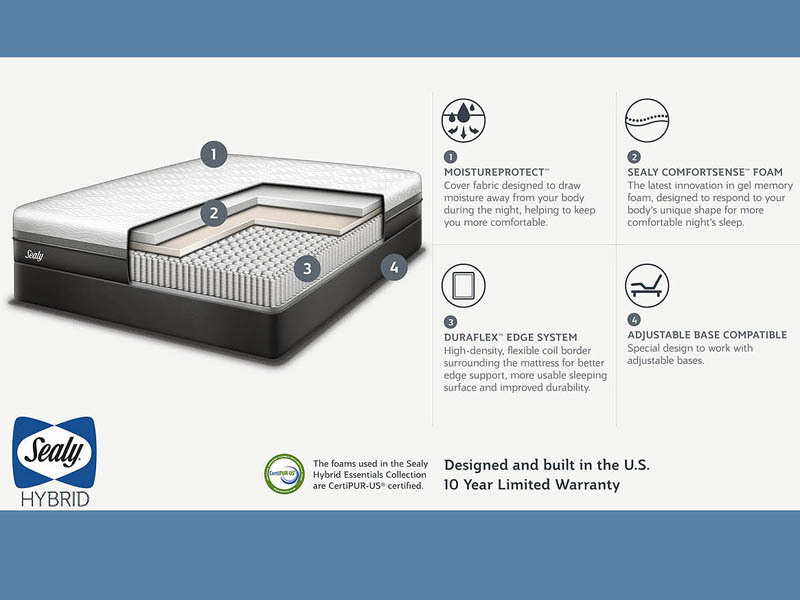 Sealy Immersion Advanced Technology Foam – A slower responsive memory foam that allows for a more breathable, comfortable, cool to the touch sleep surface. Duraflex Edge System – High density, flexible edge border surrounding the mattress for better edge support, more usable sleeping surface and improved durability. 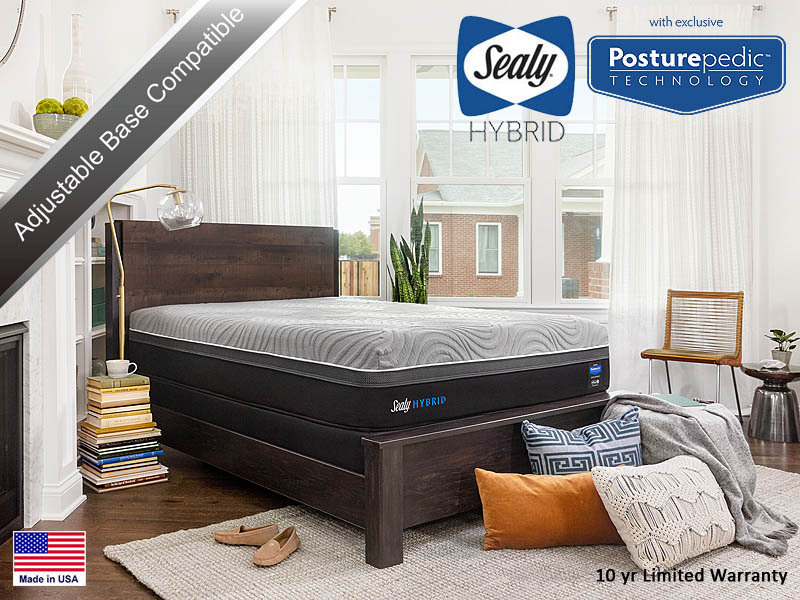 Sealy Hybrid provides quality and comfort with the deep down support of the Response Pro Encased coil. The Duraflex Edge System and pressure relieving Sealy Comfortsense Foam. Moistureprotect – Cover fabric designed to draw moisture away from your body during the night, helping to keep you comfortable. 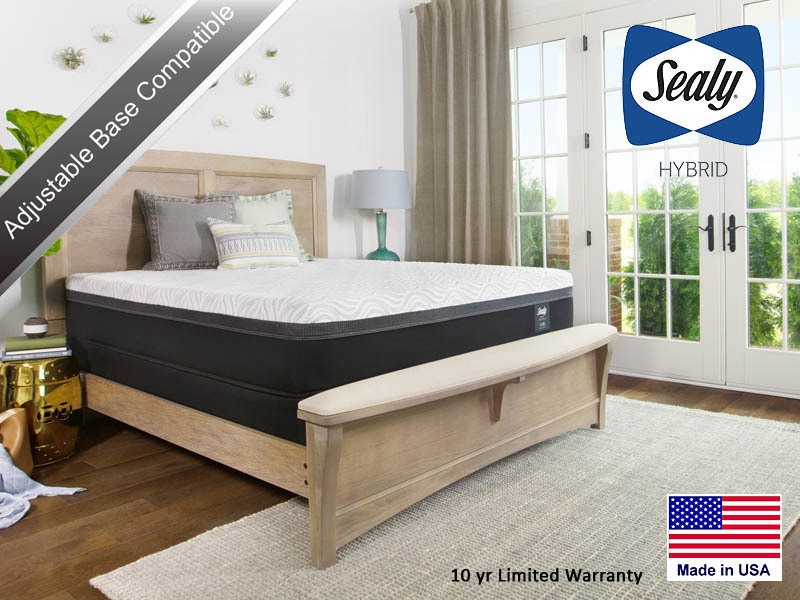 Sealy Comfortsensefoam – The latest innovation in gel memory foam, designed to respond to your body’s unique shape for a more comfortable nights sleep. Duraflex Edge System – High Density, flexible coil boarder surrounding the mattress for better edge support, more usable sleeping surface and improved durability. Quilting includes 2″ of Sealy CushionAir foam designed with peaks and valleys to allow additional air flow and added softness for comfort. .5″ of SealyCool Gel Memory Foam to give you reinforced support where you need it the most. Available with a 9″ or 5″ H StableSupport Foundation. Or upgrade to a Sealy adjustable base to create the perfect place to relax. 2.5″ Comfort layer of SealyComfort Super Soft formed foam and a core support center of 0.5″ of SealyComfort Gel foam over Sealy Classic Coils to provide a soft, plush feel with a balance of comfort and deep down support. Features a soft knit cover with 2.0″ of SealyComfort Super Soft Formed foam in the quilting. Features a soft knit cover with .75″ of SealyComfort soft foam in the quilting. Available with a 9″ or 5″ H SupportFlex Foundation or upgrade to a Sealy adjustable base to create the perfect place to relax. 7.5″ of SealySupport Gel Base foam. This is the latest innovation in gel memory foam designed to respond to your body’s unique shape for a more comfortable night’s sleep.